After a nearly fifteen year hiatus the excellent "Masques" series is back with its fifth edition, which is also its biggest collection of stories to date. But does bigger necessarily equal better? As with the earlier editions, Masques V offers a balance of well known, seasoned writers with relative newcomers. There is also no set theme to the collection. The stories here are as varied as in any anthology you are likely to come across. The only common thread is that each of the stories would fall under the loose category of "dark fiction." Three heavy hitters open the collection: Poppy Z. Brite, Richard Matheson, and Ray Garton. Poppy Brite's "Wandering the Borderlands" is an appropriate mood setter for the book. More of a philosophical piece than an actual story, the narrator is forced to deal with the emotions stirred by witnessing the death and attempted resuscitation of an apparent heart attack victim at a local gym. In Richard Matheson's "Haircut," a barber finds himself applying his trade to a most odd and unsettling customer. And then Ray Garton shows us the price one man must pay for the way he has wasted the talents given him in "Recall." Christopher Conlon's "Ghost in Autumn" conveys the emotions one man must deal with when his dead mother returns to him in the health of her youth, only to watch her travel down the same path of self-destruction she followed the first time around. "The Net" by Jack Ketchum and P. D. Kacek shows us in voyeuristic detail the dangers of falling in love online. "Disappearing Act" by Barry Hoffman displays quite literally the way that people can sometimes just fade away when they reach old age. Lucy A. Snyder brings us "The Sheets Were Clean and Dry" in which an abused woman finds a suitably unique way to have her revenge. Gary A. Braunbeck gives us "In a Hand or Face," the story that inspired his acclaimed novel, "In Silent Graves." Judi Rohrig's "A Thousand Words" documents a female photographer's fascination with a group of carnival freaks. In Geoff Cooper's "For Whom We Mourn" a man is forced to follow his murderous brother on a trek through an odd and unforgiving land in order to bring about the confrontation he so deeply desires. Then John Maclay shows us the way in which a man enacts his darkest fantasies with his collection of "Action Figures." And Ed Gorman offers us a suitably dark mystery set around a military base in "Intent to Deceive," the collection's longest story. 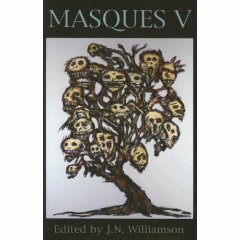 Other authors contributing to this latest "Masques" anthology include greats such as Tom Piccirilli, Richard Christian Matheson, William F. Nolan, Mort Castle, and Ray Bradbury. The names alone make this a must buy for anyone who considers him-or-herself a fan of dark fiction. But back to my earlier question: Does bigger necessarily equal better? And the honest answer is no, it doesn't. This fifth edition does not quite attain the lofty heights of the early ones. This is a mild criticism, though, as those collections could be considered some of the best of the past few decades. That being said, Masques V is definitely worth owning and will more than likely end up on a number of awards ballots this year.